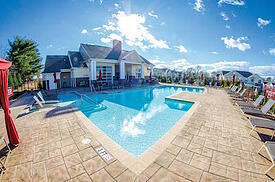 Is there any place better to relax and unwind than the resort-style pools at our Springs communities? Cool off with a refreshing dip in the crystal-clear water or chill out lounging poolside with a copy of the latest best-seller. There are many appropriate places for running outdoors, but poolside is not one of them. After all, you're supposed to be relaxing. Doesn't rushing around destroy that purpose? Whether you're in or out of the pool, there are others using the space as well. Allow room in the pool for others to swim or move around, and keep your belongings close by instead of letting them sprawl. Chlorine is no substitute for personal hygiene. Shower before entering the pool and make sure you're free of any greasy lotions or hair products. Not everyone shares your taste in music or your colorful vocabulary. Keep the tunes at a reasonable level and watch your language, especially if kids are around. Not everyone in the pool area wants to get wet. Refrain from belly flops, cannonballs and other actions that send the water splashing in every direction. As entertaining as these stunts may be, they're also an easy way to injure yourself and others. Kids and pools go together like peanut butter and jelly. Just make sure that their fun doesn't cross the line from charming to obnoxious. Also make sure that they wear age-appropriate flotation devices to help them them safe. When you're looking forward to relaxing at the pool, do you appreciate finding litter and lotion-coated chairs? Neither does anyone else. Before heading home, dispose of your trash and wipe down your chair. The pool isn't just for relaxation. It's a great place to meet and socialize with your neighbors. Our goal is to maintain an atmosphere of friendship and camaraderie for all residents of our Springs communities. What's your preference in poolside reading? Let us know in the comments!